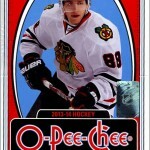 I know these have been around for around a month now, but I recently saw images of the new 2012-13 O-Pee-Chee hockey set. It took Upper Deck seven tries, but they finally made an O-Pee-Chee design that I actually like. OK, that’s not entirely true. I loved the 2009-10 design. 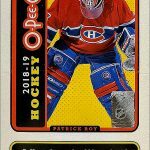 But my biggest complaint has always been the gi-normous O-Pee-Chee logo that has dominated the design every year since 2006-07–when Upper Deck started making OPC-brand cards. 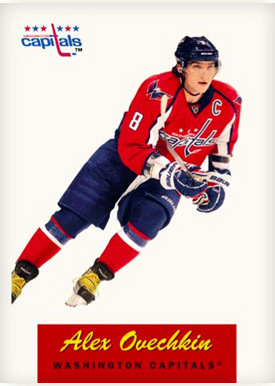 Upper Deck always felt the need to hit us over the head with an OPC logo that was unnecessarily large. But not this year. Instead, more important details–like the player’s name and team–take precedence over the brand logo. The design isn’t too shabby either–it looks modern enough, but feels kind of old school. The inserts really have me excited about this set, though. The Retro Parallel cards will be seeded 1-per pack, and have a 1950s vibe to them. 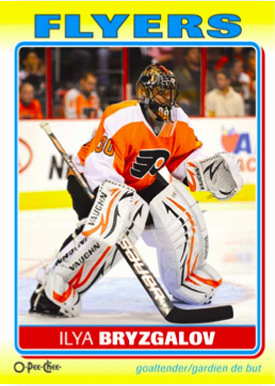 I am currently building the 2011-12 OPC Retro Parallel set (want list here), and might actually go after these too. STICKERS?!?! How freaking cool is this? As an American, I fondly remember getting a sticker in almost every Topps card set I bought back in the day, be it Hockey or a movie set like Star Wars. You’ll get one sticker in every 3 packs of the upcoming OPC set.This sticker’s design feels like a 1970s baseball card–simple, but colorful. Frankly, I’d rather get a sticker than a retro rainbow black die cut parallel. And don’t worry–there will be 8 rainbow parallels per box, too. And harder-to-find black rainbow parallels. This is Upper Deck we’re talking about. 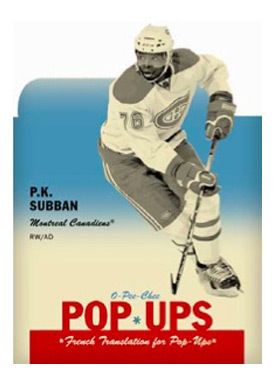 You’ll also get 2 pop-ups per box. While I’m not exactly a fan of the idea, I do like the fact that we are getting some variety in this year’s OPC product. Plus, I’m kind of tired of inserts like Trophy Winners and Team Checklists. 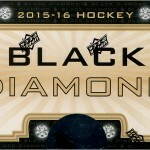 One idea I really like are these manufactured Team Logo Patch cards. 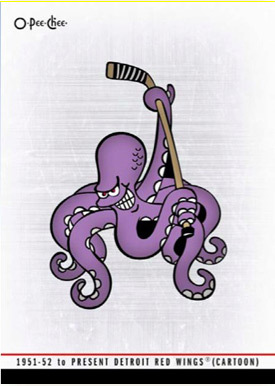 I guess these are going to feature different incarnations of team logos, or a team’s supporting logo, like the Red Wings’ cartoon octopus. Unfortunately, these will be hard to get–1 in every 96 packs–so I won’t hold my breath. I like the idea of collecting team logos, past and present. That would have made a cool insert set itself, even without patches. Oh well. 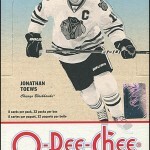 The 2012-13 O-Pee-Chee set will be released August 14. I’m definitely going to collect it. Now my only debate is, do I buy a complete set (like I did this year) or do I buy some boxes. 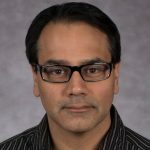 One way is more effective, but the other way is more fun–and expensive. I totally agree. Finally a nice looking OPC set. When I saw these a little while back a big debate started in my head too. Do I go after this set or not. I think I would 100% do it if boxes weren’t 60 bucks a piece. Hard to argue going after this set when Score boxes are almost half that price in my neighbourhood. Right. 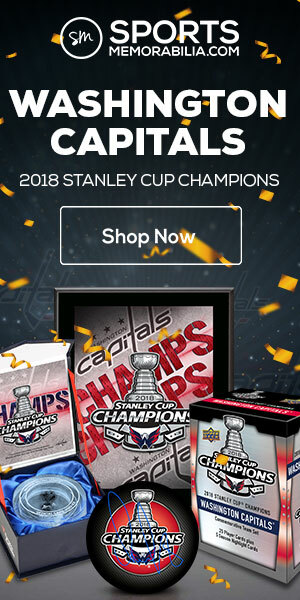 I almost bought a few boxes of the 2011-12 set, but instead–drawing inspiration from a blog post you wrote–I decided to just flat-out buy the set. I think I paid $120 or $130 for the complete 11-12 OPC set, including the SPs. I thought that Score would be a good “adversary” for OPC: the sets are about the same size, you get more cards per packs, and the card backs are so much better. But Score’s collation is just as atrocious. Glad to help, the 41 bucks I paid for a complete Score set including SP’s allowed me to get a bunch of great singles. But there is always that missing fun of wax ripping. However, if you pick and choose which to just buy outright I think we end up ahead in the long run! I’ve been watching the OPC designs for the last few years too. I liked the 08/09 set a lot and am almost finished all of it (minus the retros and parallels). This year’s aren’t bad, though I’m not real hip on the aqua and yellow. Hope that varies with different teams. I like the inserts a lot, though, so maybe I’ll pull the trigger. I keep starting new hockey sets, but end up with the last dozen cards still missing since singles are tough to come by here in Maryland. 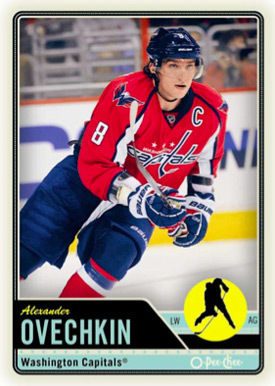 The 2008-09 OPC set wasn’t a bad design. But again, it had that huge OPC logo on it. I do hope that the 2012-13 set changes the colors for every team, like you suggested. I hope the stickers use different colors, too. I think you hit the nail in the head. The HUGE OPC emblems on the last few years almost seems “Victory” like which is a pretty big turnoff for me. 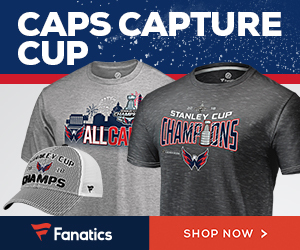 Those do look good. There’s a bit of 1973 baseball or 1990-91 Score in there with the little icon of the player. If they fix that, this may be a real keeper. I completely agree. The backs are horrible, really cheap looking. You try could buy retail boxes. Or wait a bit into the season and get a fat pack box, although they can hard to find sometimes and you’d be way short on SPs, but you’d get all the regular base. Then use your savings to buy the rest you need. Yeah, I’ve thought of that too…but it’s still a good idea. The problem is, I think I’d pay more buying the SPs. If I was just doing the base set, then it’d be fat packs all the way. After seeing those pics…I’ll definitely be buying a box next year! I always buy OPC every year. They get me with the nostalgic name. I thought last year’s design was pretty good but the one for the upcoming season looks amazing. I especially like the pop ups. Looks pretty cool, but I think the silhouette of a player in the bottom right corner of the base set is a little unnecessary. To me something relevant to the specific player, like a team logo, would make more sense there. The retro parallels are so simple but they look amazing. And I think the logos is in awesome idea. I just wish they were going to be inserted in more packs. This is definitely a different (and better) than other modern OPC sets.